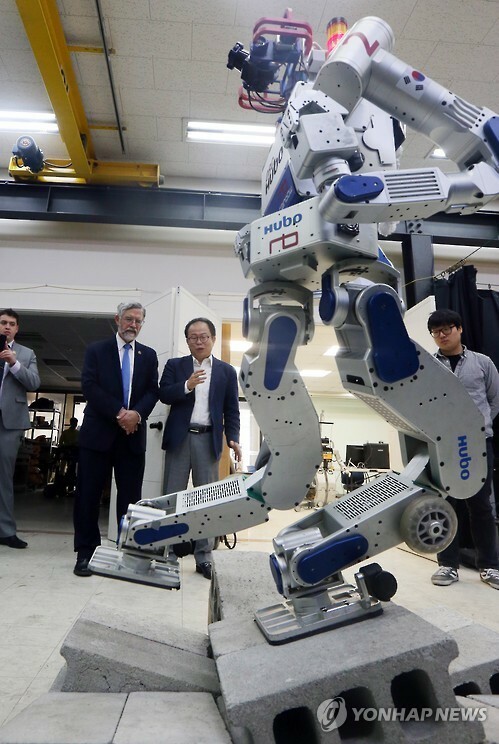 South Korea and the United States will spend a combined $6 million on a joint research project to develop robotic technologies for disaster response over the next three years, the trade ministry here said Tuesday. Officials from the two governments, including South Korea's Director General Kim Jeong-hwan and US Assistant Secretary of Defense Stephen Welby, held a kick-off meeting in Seoul on the Korea-US collaborative program sponsored by the South Korean Ministry of Trade, Industry of Energy and the US Department of Defense. It is a followup step to a deal between the two sides in April 2015 to develop next-generation robotic systems for disaster environments. Experts and researchers from the countries' top-ranked universities and research centers such as the Korea Advanced Institute of Science and Technology and the Massachusetts Institute of Technology will team up to participate in the Korea-US collaborative program, according to the ministry. They will jointly study ways to apply fundamental robotic technologies to humanitarian assistance and disaster relief tasks in the three categories of robot platforms, human-robot interaction and control, and modeling of a disaster environment. Each country will inject $1 million into the project every year for the next three years.